Accompany me to our profitable farmyard – later called „Phillipshagen“. We could not stop the secularisation in 1534, hence our convent estates passed into the hands of Pomeranian Duke Philipp Julius. To remedy the Duke´s constant money problems the ducal farmyard Philippshagen was newly established at the beginning of the 17th century – at the expense of the profitable farmyard including village Grotenhagen. The subjects had to leave their farmsteads and resettle on assigned grounds, which were less profitable. From 1630 until 1815 Mönchgut had been under Swedish rule. After 1815 the province of Swedish-Pomerania was lost to the Prussians. 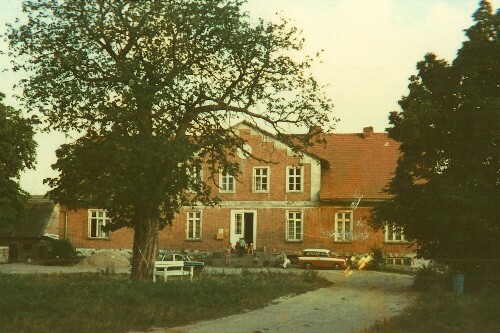 The Prussian king had the manor house built in 1828, which still exists today. Furthermore, he ensured the establishment of the Kleinbahnhof Philippshagen for the transport of agricultural products.